Just when you thought it was safe to go back into Purgatory, JoWooD announces Painkiller: Redemption, the latest addition to the increasingly-large Painkiller family that finally sees the return of Heaven's original hitman. Here's a bit of brutal honesty: every new addition to the Painkiller franchise has been substantially crappier than the one before it. The original 2004 shooter from Polish studio People Can Fly was brilliant, the Battle Out of Hell expansion was decent but comparatively flat, Overdose was just plain bad and the less said about Resurrection, the better. But that's not going to keep beleaguered publisher JoWooD from trying to rediscover the magic yet again with Painkiller: Redemption, which will see Daniel Garner, the original Painkiller, team up with the half-angel, half-demon Belial from Overdose to bring an end to the wars between Heaven and Hell once and for all. "The newest add-on brings the Painkiller franchise back to its roots. Breathtaking action, thousands of monsters and exotic weapons are a solid foundation for a Painkiller game!" said JoWooD's Reinhard Pollice. "With Painkiller: Redemption we deliver six new, thrilling levels for an unbeatable price!" Sadly, he neglected to mention what that price will be, but did reveal that Redemption will offer seven to ten hours of gameplay with improved graphics, better AI, "detailed ambiance" and more than 6000 dudes to murder. Unlockable tarot cards will make a return, as will the ability to collect souls, turn into an invulnerable super-demon and kill everything you see simply by giving it the stink-eye. It sounds like all the necessary Painkiller elements are in place but as history has shown, coming up with a really good, balls-out FPS is a lot harder than it looks. Will JoWooD finally be able to pull it off? Stay tuned! UPDATE: Thanks for staying tuned, because we just got the lowdown straight from JoWooD. 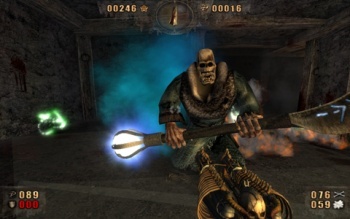 Painkiller: Redemption is the debut project from a Polish team calling itself Eggtooth and does in fact use an improved version of the original Painkiller engine, with the same enemies and weapon models as the first game. "Because it is an add-on, Painkiller: Redemption is not to be mistaken as a huge new game," said JoWooD's Clemens Schneidhofer. Nonetheless, he added, "It will be a solid game for Painkiller fans!" As befits an expansion to a six-year-old game, it will also be fairly cheap, with a suggested price tag of $4.99. That's not bad for another ten hours of painkillin'. Painkiller: Redemption comes out on February 14th on all the digital distribution big boys, including Steam, GamersGate, Direct2Drive and Impulse.